Petronella, the bossy maid in the leopard-print doek, is the new queen of South Africa’s small screen. Everyone’s favourite auntie, Thembsie Matu – who plays the spicy, know-it-all domestic worker in The Queen on Mzansi Magic – lifted both the Favourite Actress and Ultimate Viewers’ Choice awards at a glamorous bash to reveal the winners of the annual DStv Mzansi Viewers’ Choice Awards. The event took place at the Sandton Convention Centre on Saturday night. But Matu – who also recently lifted the Diva Extraordinaire gong at the Feather Awards – told City Press that she has had to fight tooth and nail throughout her 30-year career to prove that talent can trump a model’s figure and social media fame. Growing up in Katlehong, Gauteng, Matu fell in love with community theatre – especially with the work of playwright Gibson Kente, dubbed “the father of township theatre”. One day, Kente was staging a production at a nearby hall and she joined the auditions backstage afterwards. He wanted her to join the company. She would go on to perform in several Kente classics, and she mastered the Gibson Kente technique, which was about living every physical aspect of a character and perfecting the art of singing and dancing, not just acting. But when Kente passed away, Matu had to get an agent and move into TV to make a living. Matu’s first big break had been in Kente’s play, What a Shame. At the age of 22, she had to play a 75-year-old granny. And when she auditioned for the famous Doom ad, in which she played a woman trying to stomp on a cockroach but had to turn the moves into a dance routine, Kente’s physical techniques saved the day. Just as they did when she was cast as the twerking cleaner in a Joko ad. “Binnelanders hired me for my bum after that ad ... My bum works for me,” she says with a deep, throaty laugh that soon has everyone around her laughing, too. The adverts kept her afloat while she tried to land acting jobs. She lied to her agent about her body size over the phone just to get a meeting to prove her talents. The agents said they’d sign her, but only if she first landed jobs. “I went out and, in a week, brought back several jobs,” she says. Her next battle was when TV producers started telling actors they needed to have sizeable social media followings to get roles. 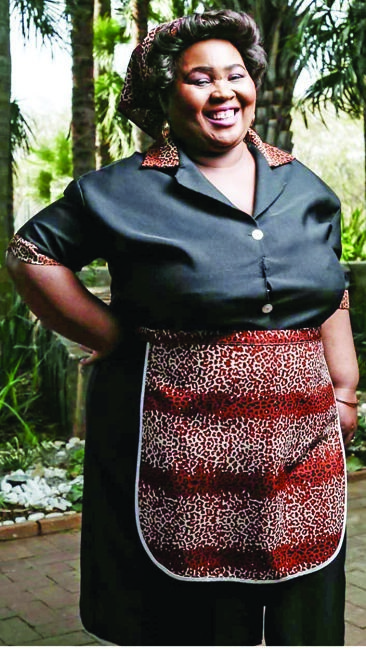 She eventually opened social media accounts once she was cast as Petronella – because fans kept begging her co-star, Rami Chuene, to tell Petronella to please come online. Matu says her current fame is all thanks to her role as the maid and because Connie and Shona Ferguson, producers of The Queen, allowed her to script her own lines and improvise. Sources on Rhythm City say the problem has been that Matu is so busy with The Queen that they struggle to fit in with her schedule. Either way, it’s all about Petronella now, for Matu and her fans. She says both she and Petronella are go-getters who know how to love, and both use taxis to get around. But she doesn’t klap men and she works for her money. “I love money too, but it’ll come from acting ... or from gambling,” she says, followed by another rumbling laugh.